I don't grow many old-fashioned roses in my garden - yet! I'm interested in getting more, though - and visits to old-fashioned rose gardens always inspire me to write huge lists. I love the history which accompanies old roses, with so many named after real people. There's plenty of space here for new rose garden areas, plenty of sunshine and fresh air, and some good comprehensive old rose catalogues. Pity about the lack of money! It's so hard to choose the best one. I hope you'll enjoy my modest collection, which I promise will soon get bigger! I only grow two moss roses in my garden - the muddy purple-red William Lobb and the clear red-pink Henri Martin. I've planted them both near water features, where they are encouraged to be their own natural shape. Just beautiful! When I was choosing old roses for the orchard, Madame Caroline Testout really appealed to me as the 'mother of all hybrid teas'. She sounded soft and gorgeous, and I had enthusiastic, misty visions of antique pink loveliness. Multiple climbing Lady Hillingdon roses should be growing happily in my garden. I say 'should be' - two, ordered from an expensive specialist rose nursery, have floundered around. However, a budget supermarket Lady Hillingdon, found starving in a plastic bag, has thrived. So the moral of the story is? Here's an old-fashioned rose that all country gardens should welcome with open arms. Souvenir de Madame Leonie Viennot loves to drape and sprawl along fence lines. Her flowers are an adorable blend of pinks and peaches that only roses can get away with. In my earlier garden days I was impressed by roses climbing along country fences and up into country trees. So I planted a couple of Alberic Barbiers along the Driveway fence to do just this. Two of him! What a beautiful country rose Souvenir de la Malmaison is - when seen from a distance. This rose spreads and arches her fat pink flowers, and looks drop dead gorgeous. But don't get too close! My Banksia Lutea rose - a yellow Banksia - started life as a small cutting. It was nipped (oops) from a bush I saw on a country garden tour. Raubritter is a beautifully cupped old-fashioned pink rose, which I first saw growing at Lyddington (a garden filled with old roses in rural Canterbury, New Zealand). One of my favorite striped roses is the old-fashioned shrub rose Honorine de Brabant. She started life unfairly squashed into a shady garden, rudely kept in place by a wooden cage. Now she enjoys sunnier times in the Dog-Path Garden over the water race. Reine des Violettes (Queen of the Violets) is one of the prettiest old-fashioned roses I grow. She has been shifted around a fair bit, and at the moment lives near the woodshed underneath a variegated elm. This rose has a beautiful fragrance. Complicata is a once-flowering old-fashioned rose I grow in the messy garden in front of my (equally messy) glass-house. It's a rose that likes to spread out over other plants. A well behaved scramble sets its large single pink flowers off nicely. 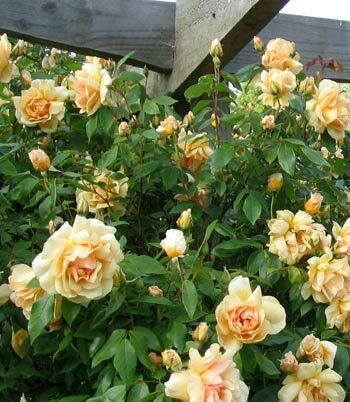 The soft apricot rose Crepuscule contributes so much to a garden - it's thornless, and the new growth is clean and reddish in colour, so there's no desperate need to dead-head it. Mutabilis can never claim to be a neat, manicured rose. Its flowers are scattered over the bush, facing different directions, all in different states of growth or decay. They remind me of a swarm of butterflies resting between flights.